How to Configure FTP User Isolation in IIS 7? 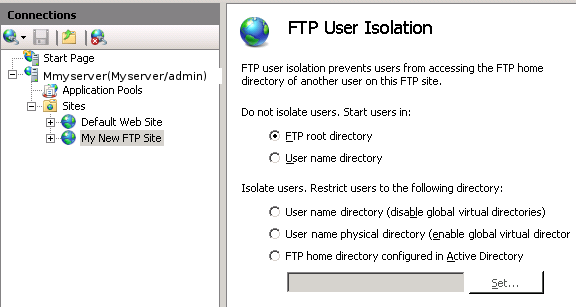 Following article will assist you to configure FTP user isolation in IIS web server. In IIS Manager, Expand the Sites tree and select the website of interest. On the Features view, you will see icons for all of the FTP features. Double-click the FTP User Isolation icon. If you enable this option, all FTP sessions will start in the root directory for the FTP site. 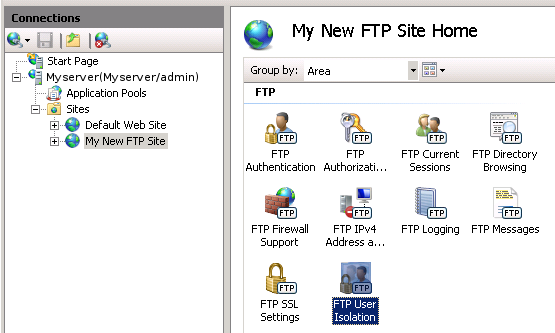 If you enable this option, all FTP sessions will start in the physical or virtual directory with the same name of the currently logged on user if such folder exists. In case there is no such folder, FTP session will start in the root directory for the FTP site. This option will isolate FTP user sessions to the physical or virtual directory with the same name of the FTP user account. The user are allowed to see only their FTP root location. Therefore, they are restricted from navigating higher up the physical or virtual directory tree. Any global virtual directories created will be ignored. This option specifies that you want to isolate FTP user sessions to the physical directory with the same name of the FTP user account. The users are restricted to its own FTP root directory only and cannot navigate to higher up the physical directory tree. Any global virtual directories created will apply to all users. This option will isolate FTP user sessions to the home directory configured in the Active Directory account settings for each FTP user. How to change ASP session timeout from IIS 7? How to import SSL certificate in Windows server? How to set website redirection from IIS 7?